There are plenty of rare anemonefishes in the world, but few are quite so enigmatic as the species found along the southern shores of Oman—Amphiprion omanensis. 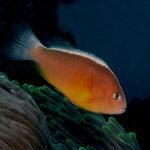 This is one of the only remaining members of the genus to have not yet been kept in captivity or captive bred, and, until quite recently, even finding a decent photograph of this fish was challenging. 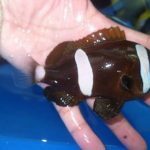 But thanks to the wonders of youtube, we now have some amazing video footage to drool over, highlighting the unique beauty of this uncommonly uncommon Amphiprion. 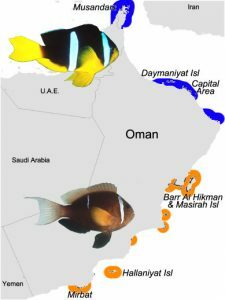 Coral reef ecosystems are rather rare in Oman. Along the northern shore, at Daymaniyat Island, the local anemonefish is the ubiquitous Clark’s Anemonefish (A. clarkii), but it’s only along the scattered habitats of the southern shoreline that we encounter A. omanensis. 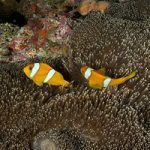 You might presume that they would be closely related, but, in fact, these two neighboring fishes are really only distant cousins, now known to belong to two entirely separate evolutionary lineages. 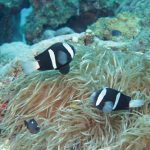 Instead, its true sister species—the Twoband Anemonefish (A. bicinctus)—can be found just to the west in the Red Sea and Gulf of Aden. Recently, both of these species were spotted together at Socotra (just off the tip of Ethiopia), a region known to sit at a major biogeographical crossroads where the distinctive faunae of the Red Sea, Eastern Africa and the wider Indo-Pacific merge. Many interesting hybrids have been spotted in these waters, including some individuals suspected of representing an A. omanensis X A. bicinctus cross. Travel Oman, This Video Beautifully Captures The Essence Of Being In Nature. Masirah Island Is Located 19 Km Off The East Coast Of Oman. Masirah Island Is Famous For Loggerhead Sea Turtles And Kite Surfing. Visit Our Website To See Other Destinations For Travelling. The heavily lunate caudal fin of the Omani Anemonefish is perhaps its most characteristic trait, imparting a graceful motion not unlike that found in a Genicanthus angelfish. While the colors may be a bit on the drab side, coming in the same earthy brown we see in A. akindynos, this elusive fish would no doubt make for a stunning addition to an aquarium. 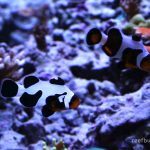 Hopefully, we’ll someday see this rare anemonefish successfully bred in captivity and made available to the public, but, until then, we’ll have to make do with these fleeting images.